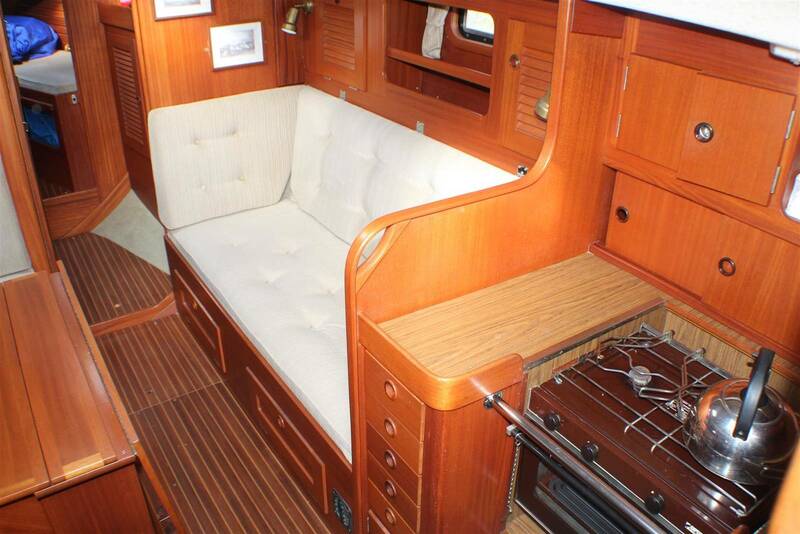 Beige fabric upholstery throughout with Mahogany flooring. 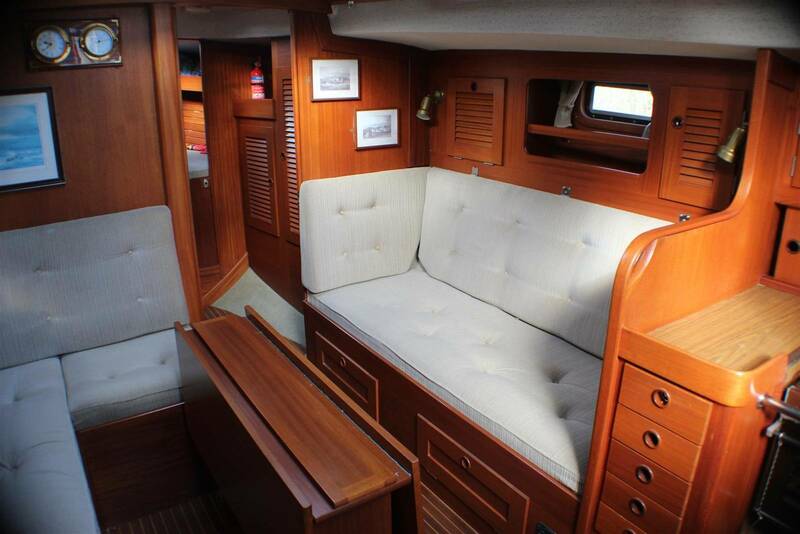 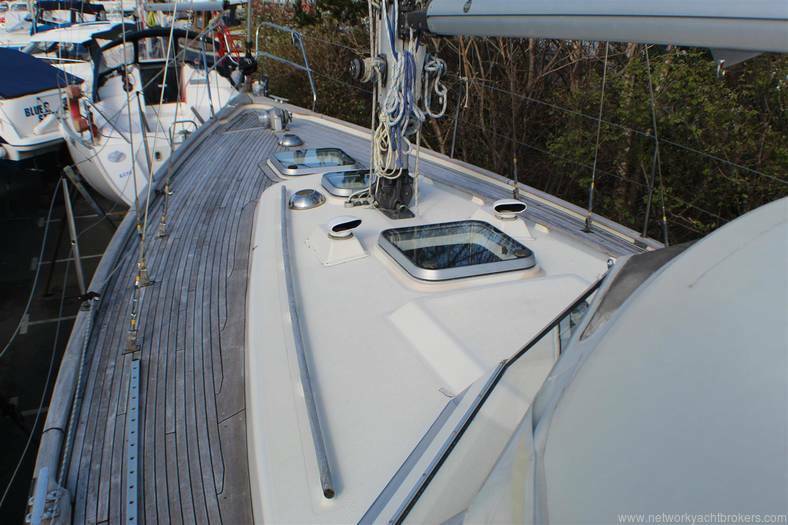 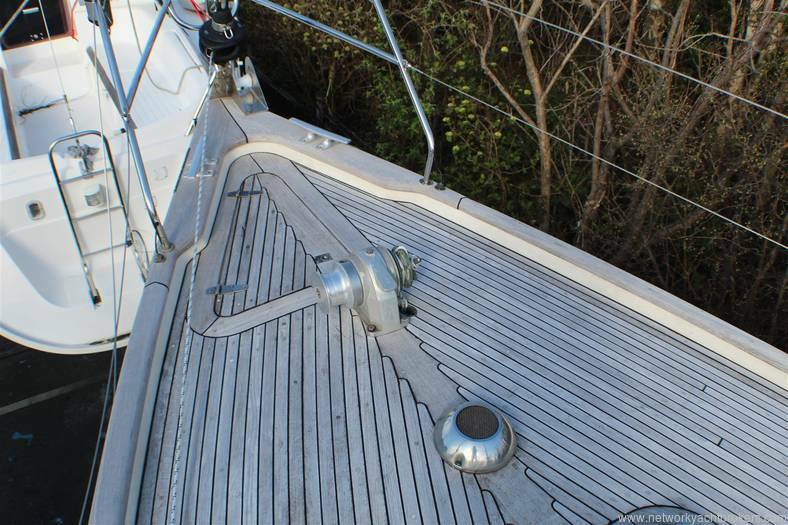 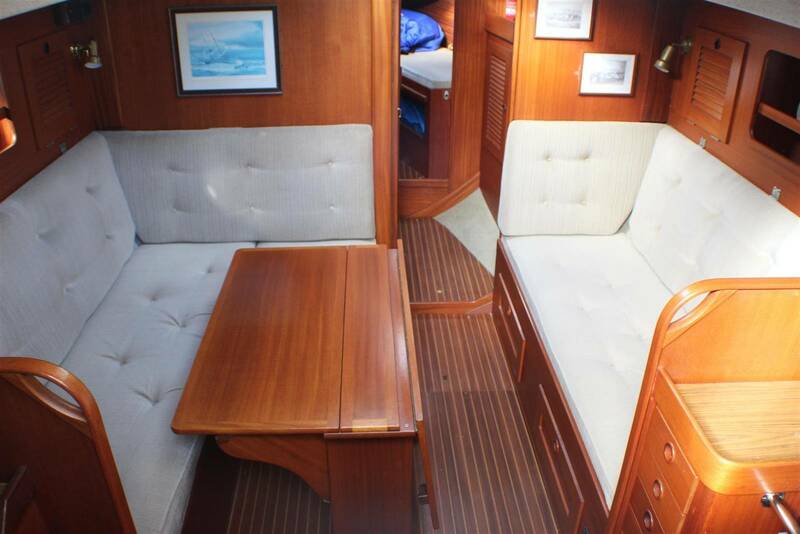 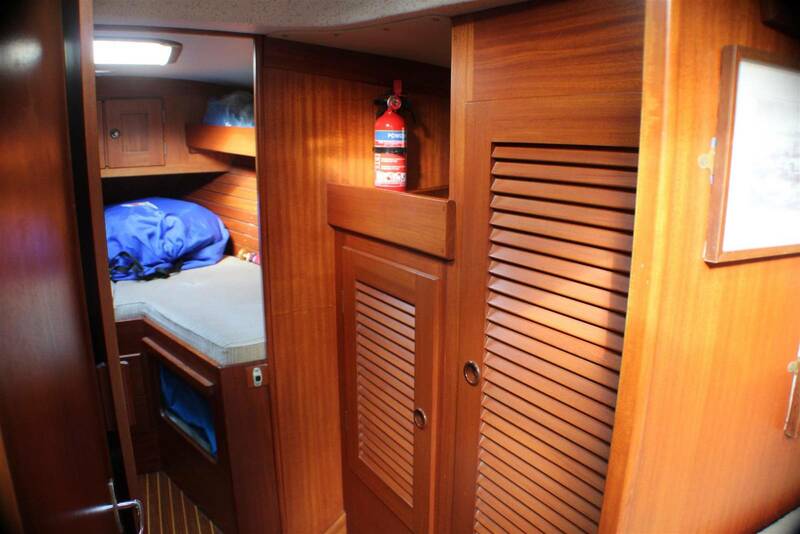 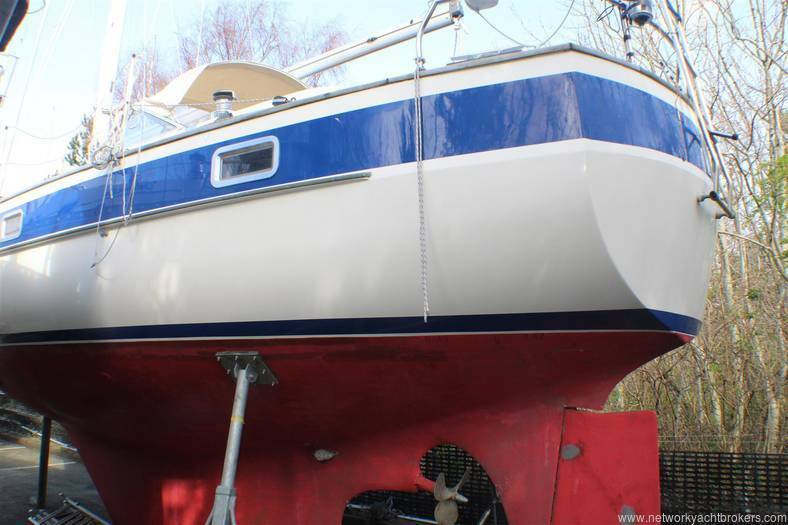 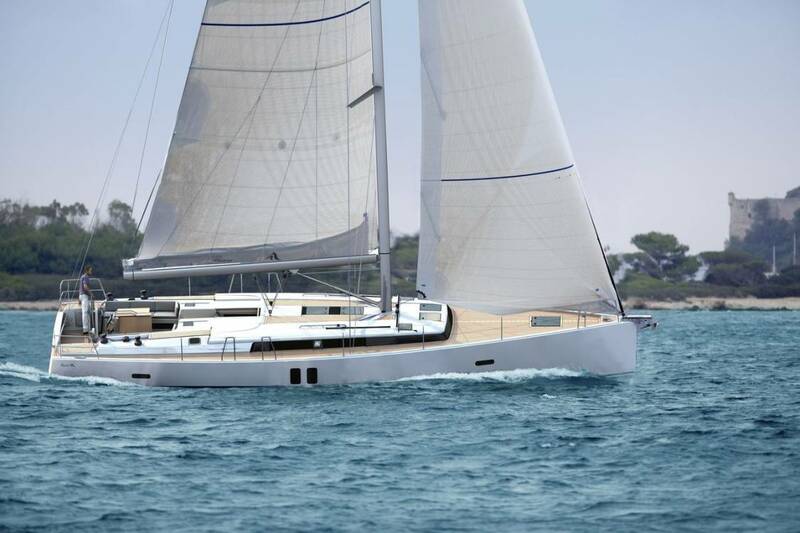 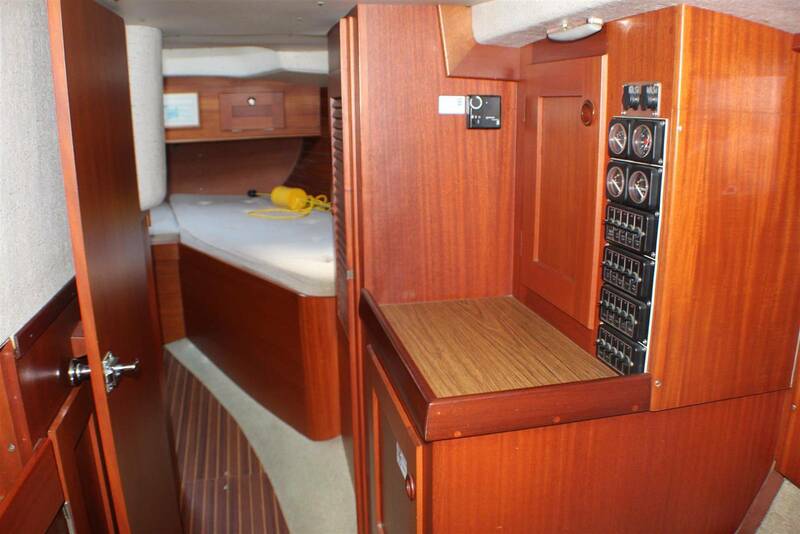 Forecabin - A large V-Berth with infill, storage under and storage lockers to starboard. 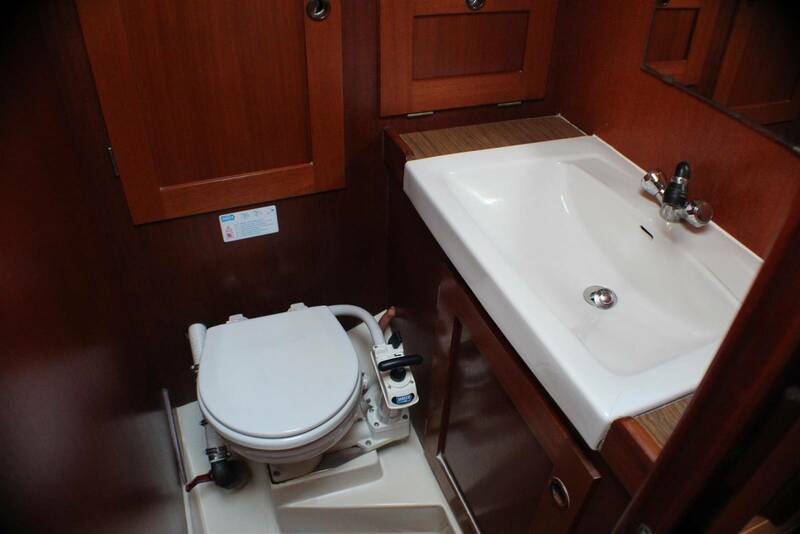 Fitted in GRP and Mahogany, the heads comprised of a washbasin, mixer tap, shower and drain, Jabsco marine sea toilet c/w holding tank, and storage. 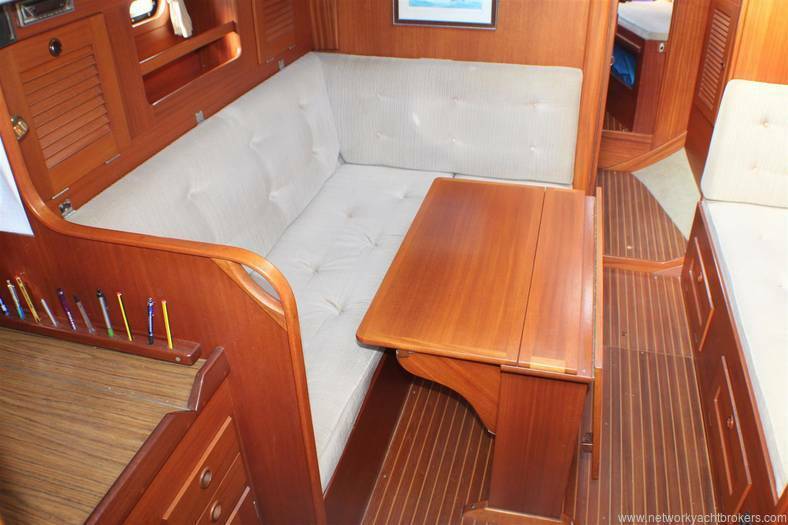 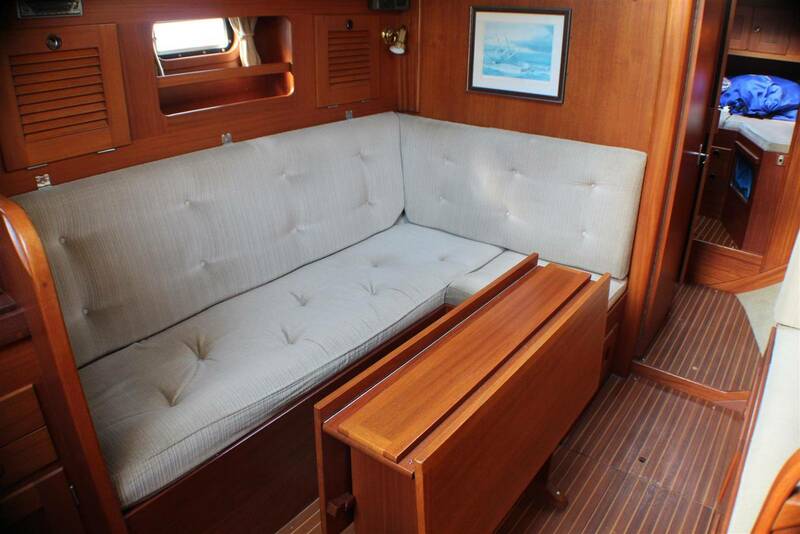 Traditional L-Shaped settee berth to port and settee berth to starboard. 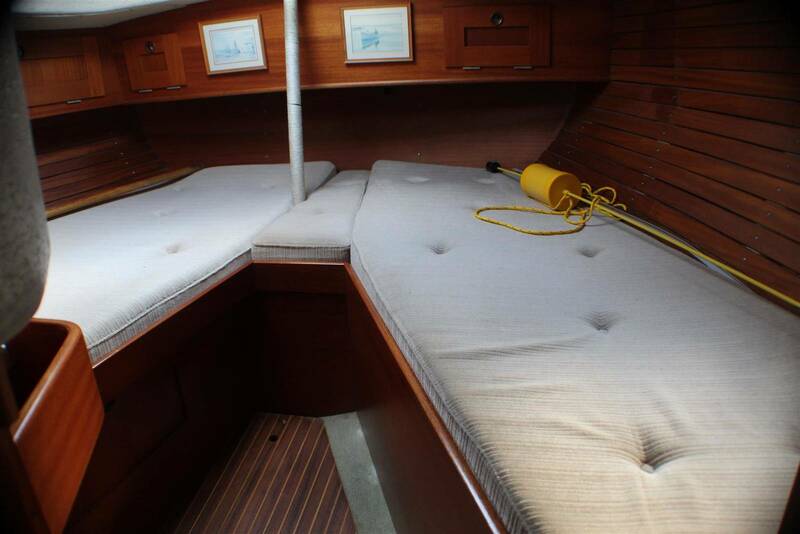 Lower berths provided with lee cloths. Backrests are hinged with the option of conversion to pilot berths. 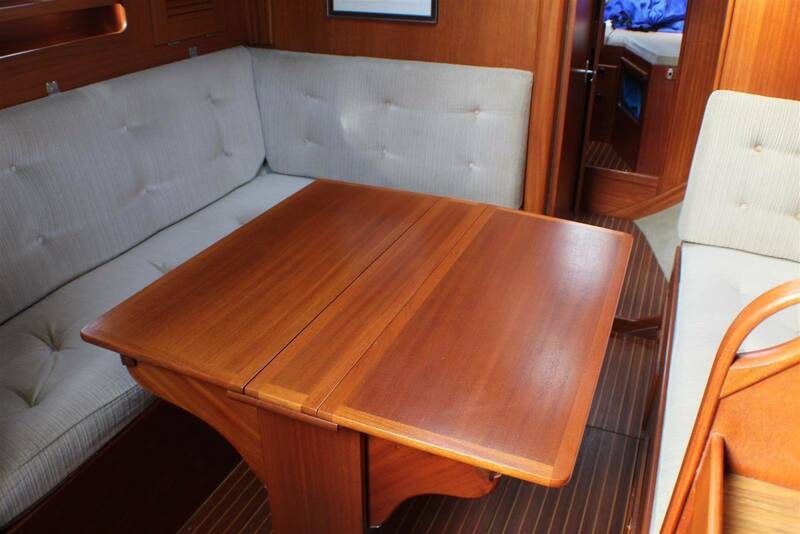 Fixed central table with bottle storage and folding leaves. 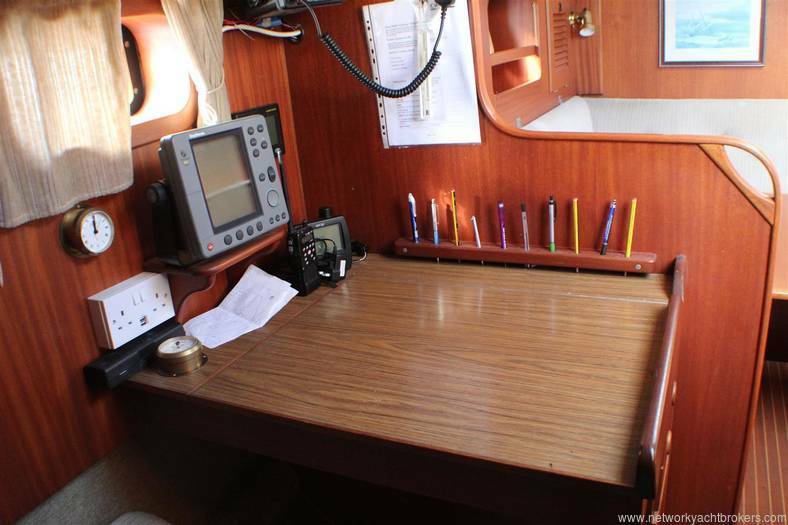 Locker outboard. 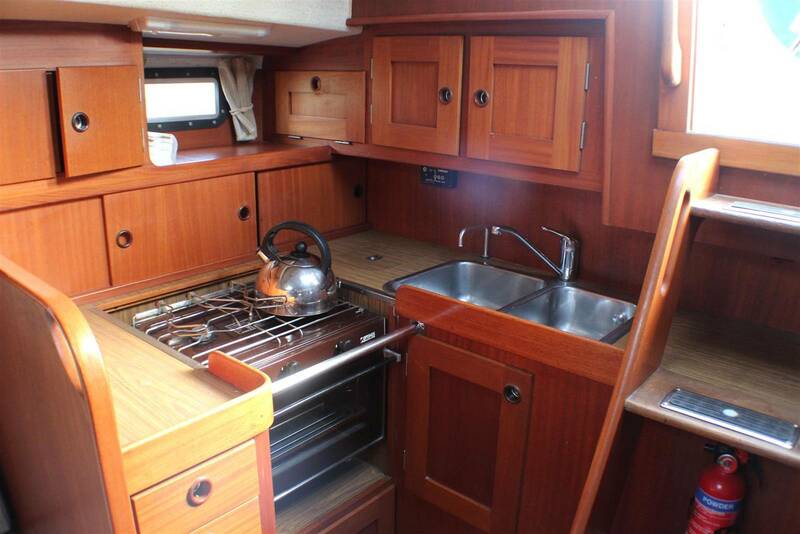 L-Shaped galley with Optimus gimballed gas cooker with two-burners and oven. 2 x Stainless sinks and an 80 litre top loading cool box with 12v refrigeration. forward facing Large chart table with navigators seat and provision for instruments and switch panels. 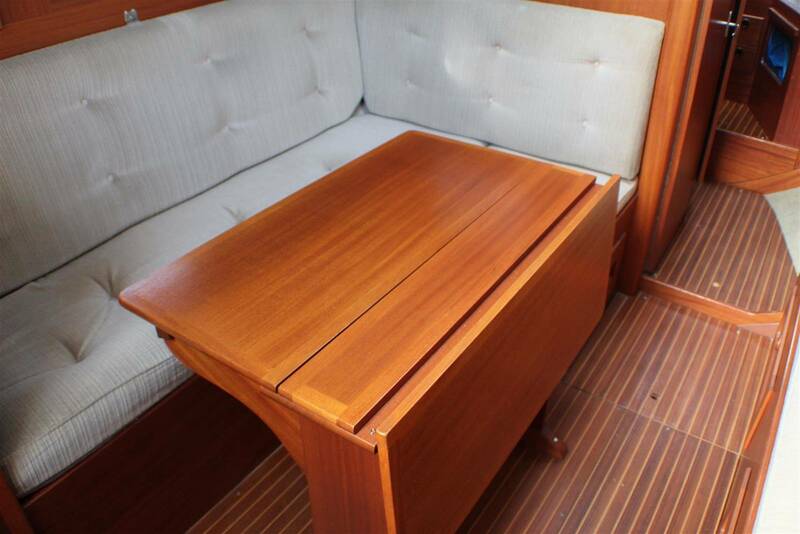 Assorted storage. Large double berth to starboard with single berth/seat to port. 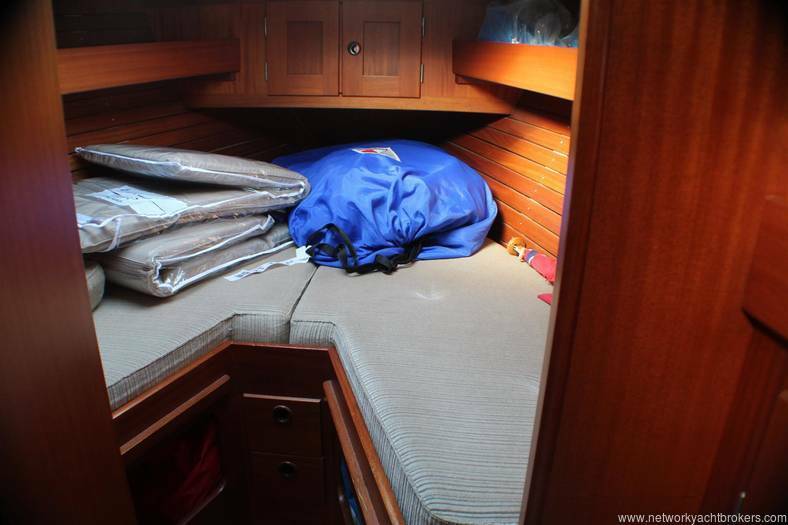 Storage under berths. Hallberg Rassy 352, designed by Christop Rassy & Ollie Enderlain and built by Hallberg Rassy (Sweden) in 1986. 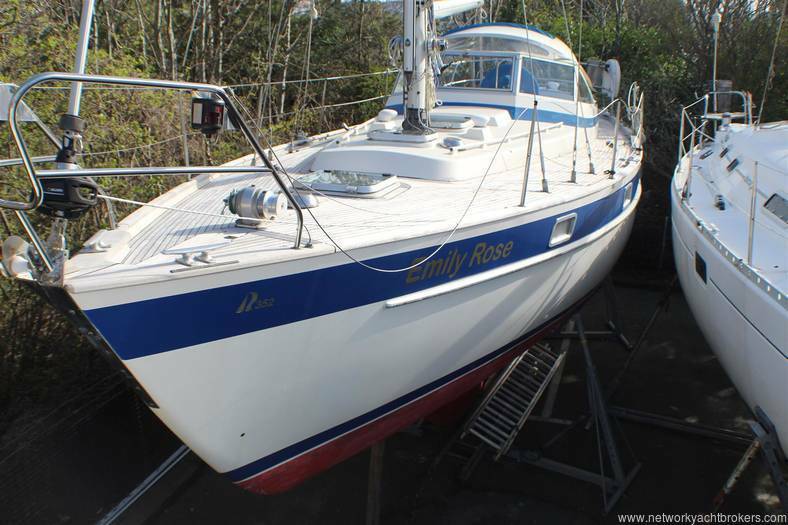 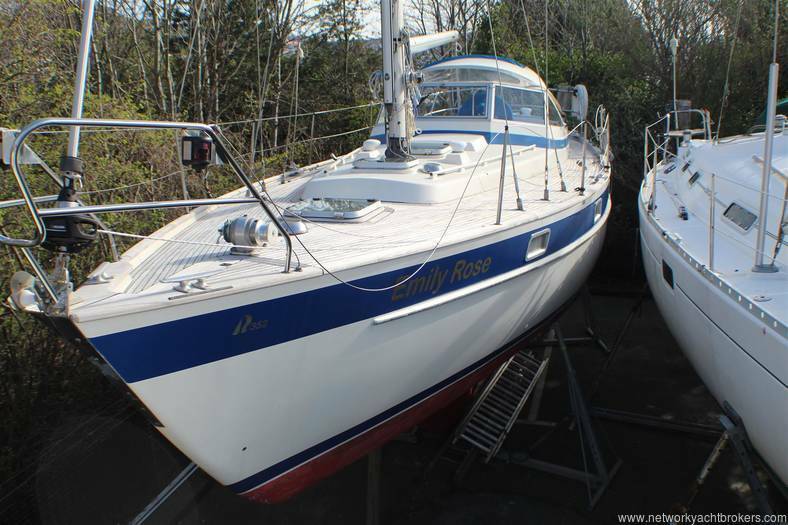 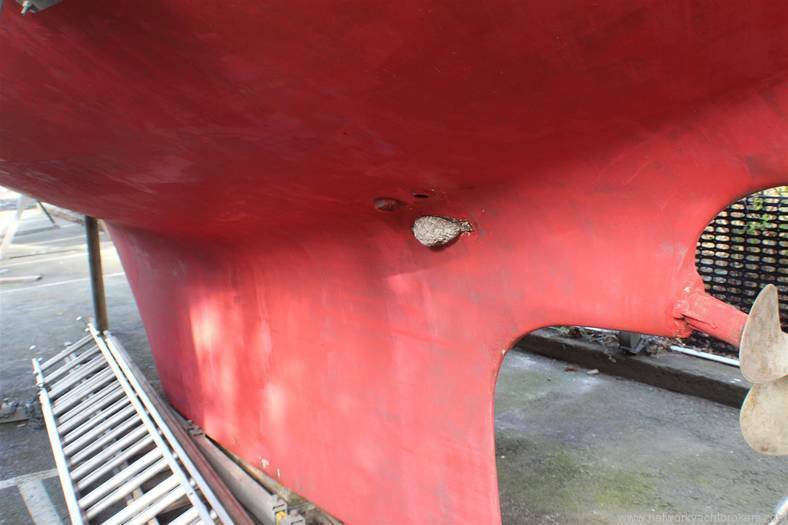 Hull epoxy treated in 1987 by Fox's Marine and re-treated in 2012. 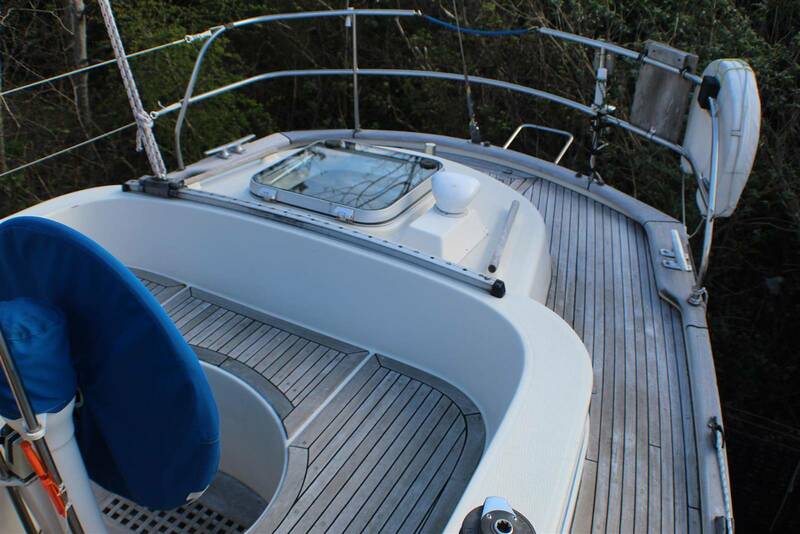 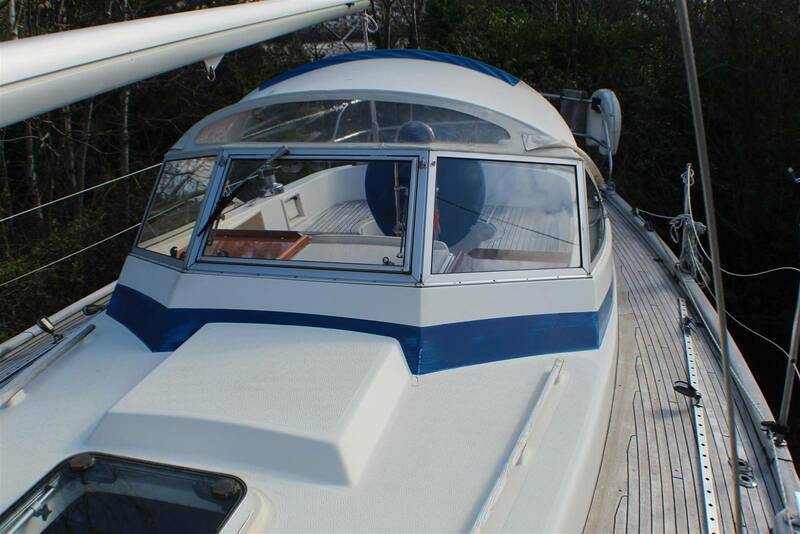 Centre cockpit cruising yacht with short counter stern, a long encapsulated fin keel, and a skeg hung rudder. Rigged as a masthead Bermudan sloop. 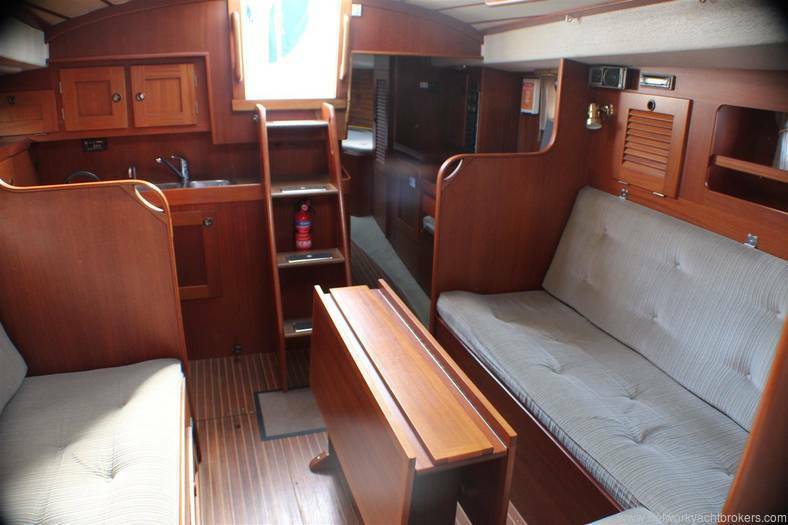 Teak laid sidedecks and cockpit seats. 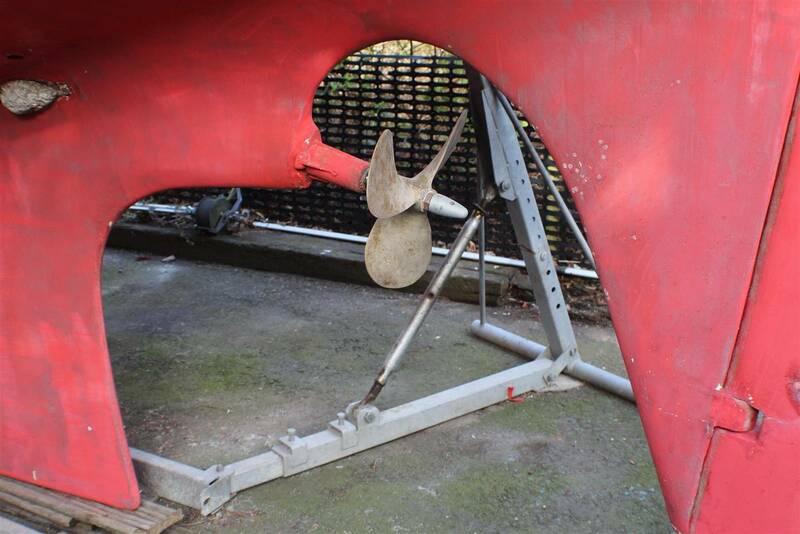 Beta Marine 38hp 4-Cylinder diesel inboard engine, reversing reduction gearbox with shaft driven 3-bladed fixed propeller. 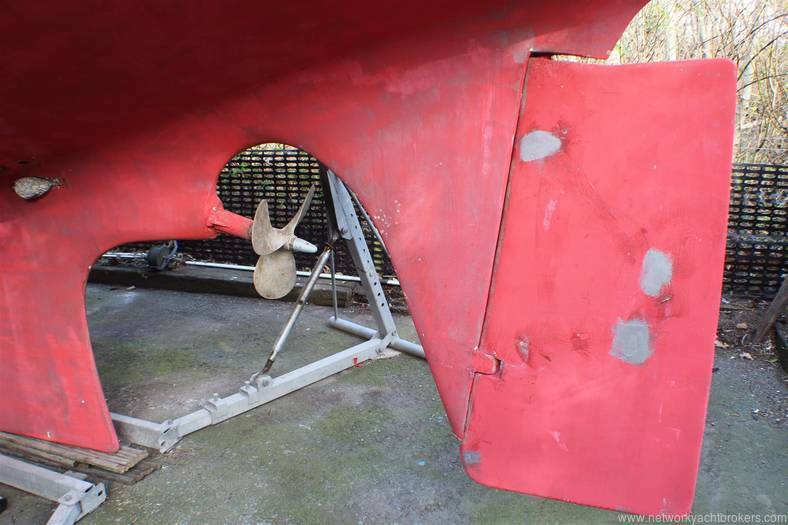 Hot water - Approx 30 litre calorifiier tank (Replaced in 2015) with immersion heater. Navigation lights to include bow, stern, steaming, deck and anchor. 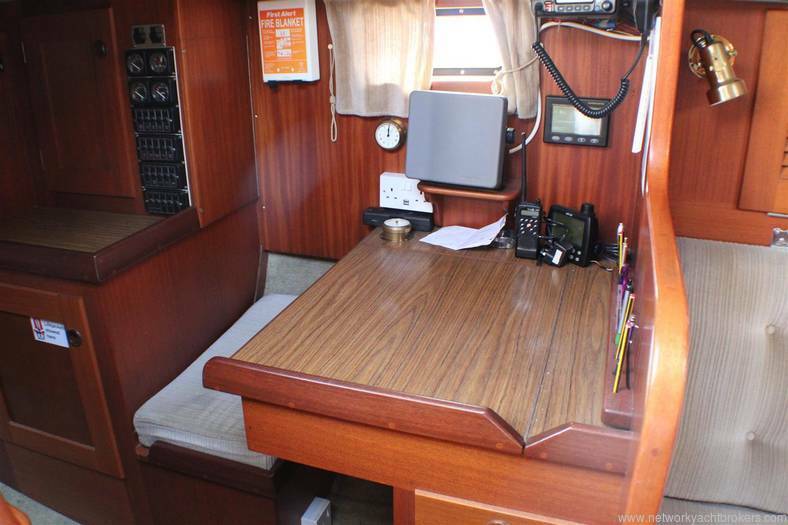 220 volt system with shore cable, RCB, immersion heater in calorifier tank, 20ah Sterling battery charger, plus 1 x outlet socket below deck. 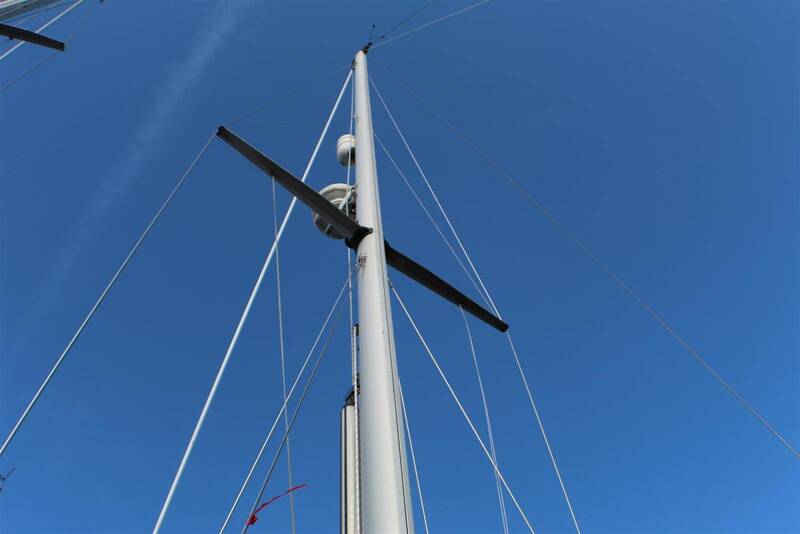 Seldon single spreader aluminium mast with slab reefing boom. 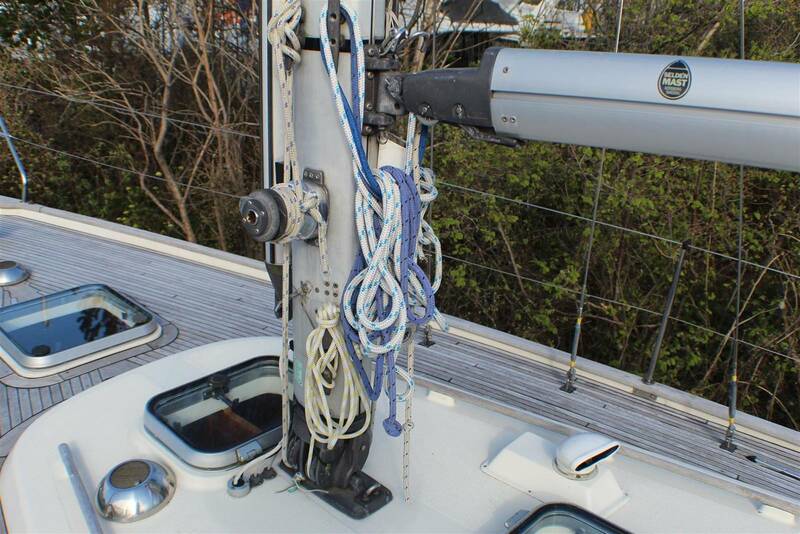 Opening chain locker containing a 16kg Lewmar Delta anchor complete with 40 metres of chain. 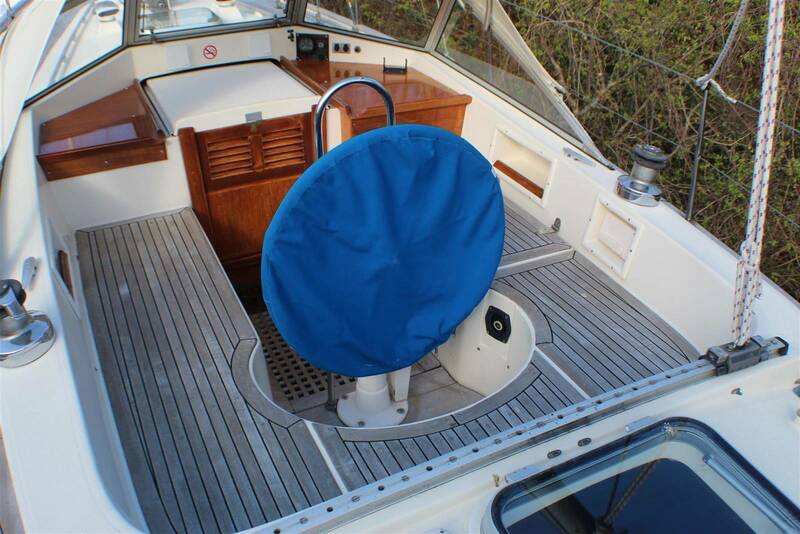 Solimar steering pedestal with leather covered wheel, engine control. Fixed windscreen with opening centre section and windscreen wiper.